There are over half a million cars on Singapore’s roads. For those who want to purchase new cars, the process is fairly straightforward: you head to a car showroom and there will be salesmen who will attend to your needs. However, the process becomes way more frustrating if you are looking to buy or sell a used car. In addition to parading around dealerships and dealing with stacks of paperwork, sellers often receive low-ball offers from dealerships, while buyers overpay or end up buying a lemon. Recognising these pain points, Carro was launched earlier this year to connect used car buyers and sellers directly with each other. This new online and mobile platform cuts out the need for middlemen. Carro is essentially a marketplace. Other than connecting interested buyers with dealers such as SgCarMart, it also connects you to sellers so you can deal directly with them. This works differently from other platforms such as SgCarMart, which acts as middlemen. 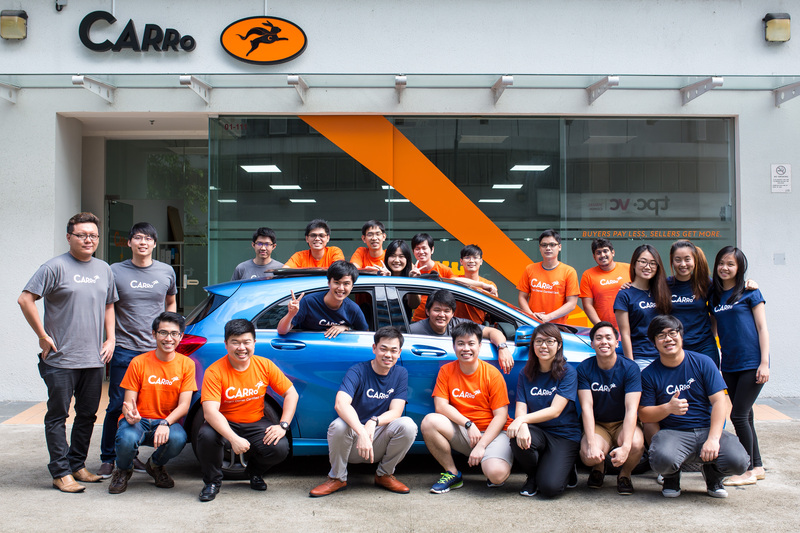 According to Aaron Tan, the director of Carro, the site’s most compelling aspect so far has been its product feature — you can use Carro to view detailed photographs of the cars you are interested in. 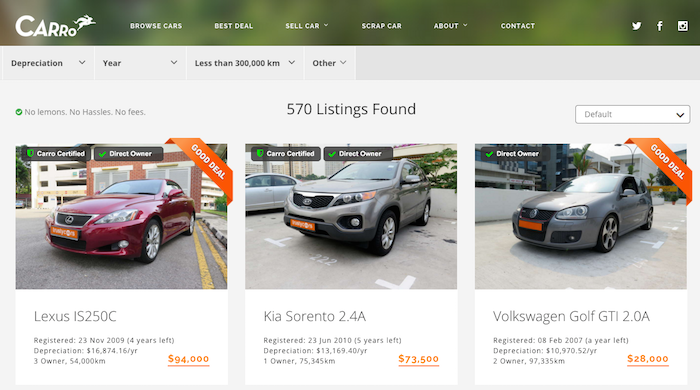 You can also see a site-generated summary of the car, as well as the scatterplot graphs which can help you make better purchase decisions. All cars listed on Carro undergo a thorough “120 point inspection” done by in-house mechanics, with defects clearly marked on each listing. Selected cars also come with a complimentary one-year warranty. One plus point for sellers is that Carro guarantees it will buy the car from you at your offer price should there be no buyers after you’ve listed for more than 30 days. We couldn’t help but ask Aaron why he and his team are looking into the used car space when there are already so many competitors out there. He explains that the used car marketplace has always been hot, but the existing classifieds model — where sellers list their used cars for sale — has not been very efficient. Buyers do not trust dealers, and dealers are not always transparent with their pricing. This is the classic middleman issue. “Dealers are still making a big fat margin — both sellers and buyers are continuously being squeezed. From the seller’s perspective, selling direct is a pain. You have to deal with calls from dealers posing as direct owners. No show for requests for test drives. Long paper work processes, settlements of loan, etc. From the buyer’s perspective, not knowing the market, having to research, etc. and worse still, getting a lemon. And finally getting the paperwork settled — all these are problems that traditional models have not been able to resolve,” Aaron told Vulcan Post. On top of that, Aaron also shares that there are tremendous opportunities in the space. “There were 70,000 car ownership transfers done last year, multiply that by S$70,000, which is the median price of cars in Singapore, we are looking at a S$4 billion market opportunity. This doesn’t include the larger new car market, alongside the ancillary stuff like modifications, accessories, insurance, et cetera,” he adds. Of course, with the potential rewards offered by the huge used car market, there is bound to be competition in the space. 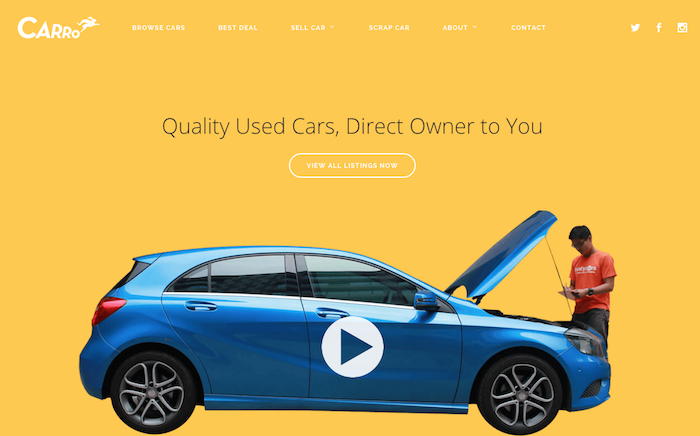 Most recently, SPH unveiled its new used car marketplace Wheel Deal. 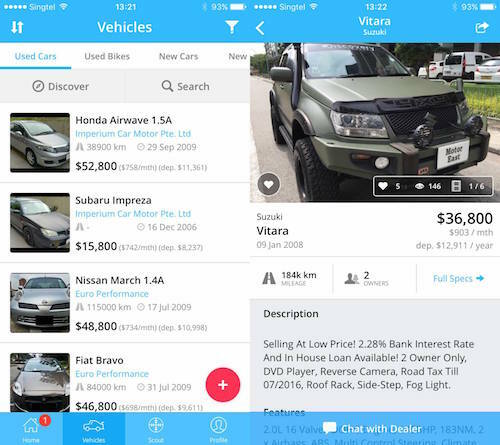 Other than that, there are also platforms such as Motorist, DirectCars, as well as Caarly, all of which are either growing quickly or have established themselves among communities of car owners in Singapore. When we ask what Aaron thinks about the SPH-backed Wheel Deal, he shared that he doesn’t see it as a competitor.